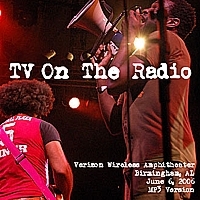 When New York avant-rock group, TV On The Radio, played on KEXP in October (click here), they were without bassist Jaleel Bunton and drummer Gerard Smith. Their stripped-down sound resulted in the group coming across like The Doors by way of David Bowie. But with a full lineup in Birmingham in June, it's a different animal. Instead of a mood-heavy show, the group's backdrop of shredding guitars puts them closer to their New York compatriots Sonic Youth. Those who haven't caught on to TV On The Radio may soon be bopping along to the U2-ish Staring At The Sun. If the song is any sweeter, it will land directly into Big Country territory but right now, it is a nice mix with that touch of The Doors thrown in. While this audience recording doesn't quite bring out the vocals, one can imagine the blistering set this must have been. Certainly a group to look out for. Thanks to Psyop96 for sharing the tracks. Click on the highlighted tracks to download the MP3s (these are high quality, stereo MP3s - sample rate of 192 kibit/s). As far as we can ascertain, these tracks have never been officially released. Click here to order TV On The Radio releases.